Lemons are my favorite fruit and this goes back to my childhood when my older siblings would all eat lemons with salt on them. One day my brother Dennis decided he should share this odd treat with the baby… yep, me! Well, I still eat lemons this way. It is a bit odd, but all my siblings grew to love lemons this way and I have also passed this culinary treat down to my son. Maybe it is in our genes? Cut into a lemon and it’s tangy tartness fills the air. The oils on your fingertips linger for hours, with a hint fresh citrus which is so invigorating. The juice is great ingredient in cooking or baking, and has the ability to change up a dish with just a quick squeeze of its sunshine juice. Adding lemon juice to your favorite beverage can create a brand new way to enjoy it. No matter my mood, lemons always bring me joy from their bright yellow color and amazing smell. Just a quick glance at my lemon bowl and it focuses my attention on all of the positive things in my life and I feel a sense of gratitude. 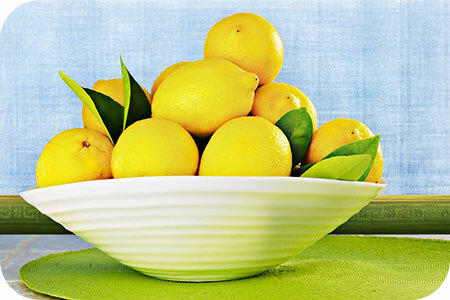 For me, harvesting the lemons from my tree is a chance for me to connect with nature and get some sunshine on my head as I carefully pick and choose the new set of nine lemons for the bowl on a weekly basis. I do keep other lemons handy for consuming and I replace, when needed, the number needed to keep the bowl filled with my bright yellow lemons… always holding an exact number of nine. Amy resides in Arizona, but through her extensive travels, she has accumulated much knowledge and love for other cultures. She is a member of the Southwest Tarot Readers Association and follows her local Arizona chapter of Astrology. Amy has been a featured guest on metaphysical radio shows, she's provided readings at conferences and corporate events, has delivered lectures on developing your own psychic abilities, and she has shared her expertise on Tarot and Astrology, having earned her certification in both disciplines. Amy grew up seeing orbs and feeling energies but brings over twenty years of practical experience to the table as an accurate Psychic, Tarot Reader, Astrologer and Medium. She has read for hundreds of clients, including one very high-profile crooner! She is always expanding her metaphysical tool belt, offering her clients many delights on her magical menu, including channeling, dream life interpretation, crystal healing, and past life exploration. If you'd like a powerful reading that will also empower you to lead a happier, more rewarding life, you can find Amy at PsychicAccess.com.